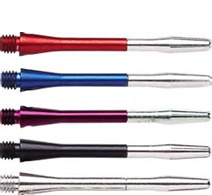 The Pool Shoppe carries a large selection of shafts, available in nylon, metal, spinners, dimplex, and super grip. 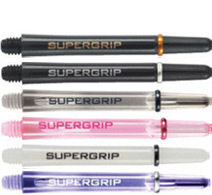 The shafts come in different sizes including micro, extra short, short, in-between, medium, and large. Come visit The Pool Shoppe for our complete selection. Alloy shafts available in medium and short lengths. Features cross-hole locking device and are super slotted for easy fit. Available in multiple colours & lengths: micro, x-short, short, medium & long. Available in black and white. Lengths available: x-short, short, midi (in-between), medium & long. Made from aluminum. The rigid shift gives extra grip. The crown tip deflects darts into a scoring zone. Lengths available: medium. 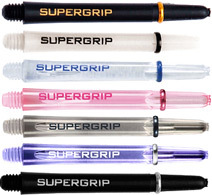 Made from natural resin, making the shaft ultra-durable. Available lengths: medium. Uses golfball technology to reduce drag and increase lift. Lengths available: short & medium. Colours: white & black. 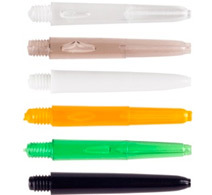 Micro thin polyester shaft. Reduces weight at the end of the dart and reduces deflections. Can be cut to customize length. Lengths available: medium. Spinning top helps reduce deflections. Available in multiple colours. Lengths available: midi & medium. Give (4g) extra weight, allowing players to “custom balance” their darts. Available in ‘midi’ length. Aluminum base with a rubber sleeve. The rubber sleeve can be cut to customize the length of the shaft. Lengths available: medium. Made from aluminum and features weight reduction zones. Available in ‘midi’ length. 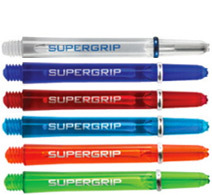 Nylon shaft that features precision rings for better flight grip. Available lengths: short & medium.